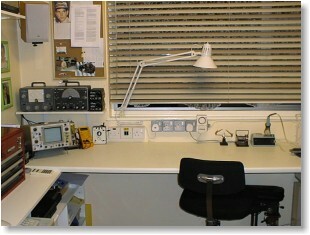 To get the most from your hobby it helps to have somewhere comfortable and permanent to use as a workshop. I am fortunate in that we moved to a larger house recently, and I am using the smallest bedroom as a workshop. I would imagine that most people will be using a garage or a large garden shed. If you have somewhere like this, which you can set up as a permanent workshop, it is worth going to some effort to fit it out with a workbench and storage shelves. The bench should be at least 2' (600mm) deep (deeper still if you are repairing televisions or larger sets), as long as possible, and at a convenient working height when seated (36" or 900mm). A kitchen worktop is ideal because it is reasonably heat resistant and easy to keep clean. In a shed or garage it can probably be adequately supported by fixing lengths of timber along the walls at the correct height, and making timber legs for any unsupported front corners. Again you might need something a bit more substantial for televisions and large, heavy radios. Shelves at each end will accommodate test equipment, much of which can be used in-situ with suitable length test-leads. A number of electrical sockets can be fitted to the wall to the back of the bench. Ideally, these should be good quality metal-clad types with double-pole switches. They should be wired via an RCD (Residual Current Device, or Earth Leakage Circuit Breaker) for safety, as well as an isolating switch fitted with a 5A fuse or circuit breaker so that the power to the whole bench area can be turned off via a single switch. If you have an isolation transformer and/or a 115V transformer, you may wish to mount these permanently somewhere out of the way, and connect the outputs to sockets mounted by the bench. You may wish to mount regularly used small tools in suitable clips on a board on the wall in front of you - this way you are more likely to put them back rather than leaving them lying around on the bench. White laminated chipboard is ideal for this, and the positions of the various tools can be marked with a permanent marker pen. Alternatively a tool-chest (as sold by Halfords) within easy reach of the bench will do the same job. On another wall you could mount component storage drawers. B&Q sell a 15-drawer cabinet for around £3, which can be wall mounted or free standing and is ideal for storing smaller components such as capacitors, resistors and lamps. Ten of these will get you 150 drawers for just £30! If you are wall mounting them you will find the top drawers open better if you remove the cabinet handle. Various sized shelves can be fitted to the other walls to accommodate valves, larger components etc. Alternatively, old furniture (such as chests of drawers and bookcases) can be used. Even if you have to buy them second-hand, they would probably be cheaper than the materials needed to make shelves! I have two chests of drawers for valve and other large component storage, a bookcase for manuals etc and a wardrobe with extra shelves added for test equipment, boxes of cable and bulky/heavy bits and pieces. All these items were discarded from other rooms in the house. Good lighting is essential. I find fluorescent lights difficult to work under, and would avoid them for close work. They are ideal for general workshop lighting however, because they produce plenty of light and very little heat. For lighting the bench itself, some sort of close-up lighting is essential. I have an angle-poise type lamp mounted at the rear of the bench - this cost about £15 in Homebase. Because of the heat from the bulb, I have fitted it with an energy saving bulb that runs a lot cooler. 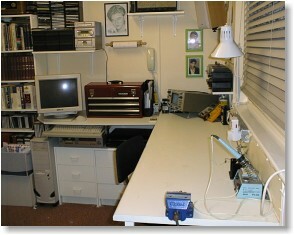 The photos show part of my workshop as it is now. The bench is a B&Q Value kitchen worktop costing about £12, mounted on a framework of 2" square timber. The window behind the bench gives plenty of natural light during the day. The group of sockets (including isolated 230V and 115V outlets) and the bench lamp can be seen. The transformers are mounted on a small shelf under the bench in the corner, and are boxed in for safety. The chair is an office type, obtained from a previous employer when they ceased trading. It is worth getting a comfortable seat, as you will spend a lot of time on it! The notice board behind the bench is used to keep service data off the bench and to stop me from losing vital notes on scraps of paper! The computer is one of our old ones. The system unit lives under the bench (rehoused in a big tower case!). It is ideal for accessing my service data CD-ROMs and for typing up the Recent Repairs articles for this website as I do the job. It is connected to our other computers and printers via a network. I have now replaced the bulky CRT monitor with a 15" TFT type purchased on eBay. None of this cost a great deal of money (it's mainly leftovers and bits bought cheaply), yet the results serve my needs fine. If you are using a shed or garage, it is definitely worth doing some work to make it a more comfortable working environment. The trouble with sheds is that they have no thermal insulation, so they are too cold in the winter and too hot in the summer! You could line the walls and ceiling with chipboard, with fibreglass insulation behind. This would be fairly expensive but it would make the workshop more welcoming. If you have some old carpet, fit it to the floor. Not only will it make the floor warmer underfoot, it will also reduce the chance of a dropped valve breaking, or a dropped screw rolling or bouncing into some hidden corner! I was reading the very good repair and restoration section on this website. In the workshop safety and advice I would like to add a few extras. A good 1Kg ABC powder fire extinguisher close to hand in case the worst happens. A first aid kit and cold running water also close by. And possibly an emergency stop contactor button to cut all supplies should an accident or nasty bang occur. I have most of these things close by just in case of an accident. If you are not able to set up a permanent workshop area, all is not lost. Many restorers manage perfectly adequately with a more temporary arrangement - generally in the kitchen. It would be worth making up a protective wooden cover for the work surface, from a piece of laminated chipboard. An old rug will protect the floor covering from accidental solder splashes and spills. The main drawback of this type of temporary arrangement is that everything has to be packed away when you have finished working, to allow the room to be used for its intended purpose. On the other hand, this could be an advantage, since it does encourage a more tidy and organised working methodology. It is also necessary to take care over cleanliness, because of the room's intended purpose of food preparation. Whatever workshop you have there are some jobs, such as stripping varnish and spray painting, that really need to be done outdoors. Unless you have somewhere covered and well ventilated, such as a carport or a garage with the door open, you will probably just have to wait for the right weather. In response to your request for tips on painting indoors. I've had good luck with a home brew spray booth made from a bathroom exhaust fan, air conditioning filter and a clothes dryer flexible vent pipe run outside, combined with a suitable enclosure. An essential item is a Residual Current Device (RCD) or Earth Leakage Circuit Breaker. These are available as adapters for use with power tools etc. Plug this into a wall socket, and power the set you are working on and the test equipment from it, via a four-way extension lead. For improved safety, I would strongly recommend the use of an isolating transformer. A 100VA type is adequate for most domestic sets (£22 from Maplin, Order Code DH52G), but it may be worth paying the extra to obtain a 250VA type, which will also be suitable for larger console sets, radiograms and televisions. If you are planning to work on equipment from other countries, it is worth looking for one with the relevant voltage tappings on the secondary, as it saves having to buy a separate transformer for this job. Neither an RCD nor a transformer will provide protection against a shock from a charged capacitor, so sensible precautions must always be taken. I suggest that an Isolation Transformer is of immense value safety wise if you can get one second hand - new ones are just too expensive and often very low current rated. They are often found second hand (called a Safety Pak or something similar) as they were a requirement for some building sites etc for power tools before they were made double insulated. Do get it tested to make sure it works and that someone hasn't connected the earth pin on the output negating its safety though - also commonly found!! Also note that only one item can be safely connected at any time regardless of the current rating. Commonly given advise when working on live equipment, is to always work with one hand in your pocket or behind your back to prevent shock current from passing through your body. However I know this is impractical, but avoid having to hold the chassis with one hand while poking around inside with the other. Ensure the chassis is supported steadily as this reduces the need to steady it with your other hand while working on it. I also go one stage further when fiddling around with sets and that is to put the plug in my pocket. This prevents the set from being accidently plugged in by me or anyone else and giving me a nasty suprise. Switch off the supply and allow the capacitors to discharge before connecting or disconnecting anything, and before handling the chassis. Never work alone. Always ensure someone is available who knows how to administer the relevant first aid, and have him or her check regularly that all is well. Please take care. It must be remembered that many sets were of the live chassis type, where the chassis is connected to one side of the mains. Before operating these, ensure that the chassis is connected to the neutral side of the mains, as this is generally within a few volts of earth potential. Some sets have a single pole mains switch, and this does not always break the live mains lead - rewire it if necessary! Take care when handling or moving sets still connected to the mains supply, whether switched on at the set or not. To be safe, withdraw the mains plug first. If possible, work on a flat stable surface with a piece of rubber mat between the table and the chassis. A car mat is ideal, and will provide some protection to the surface and you. Another danger is the high temperatures of the valves and high power resistors. Rectifier and output valves in particular can become hot enough to cause nasty burns.